Illustration at left: 40 Tillinghast Pl. 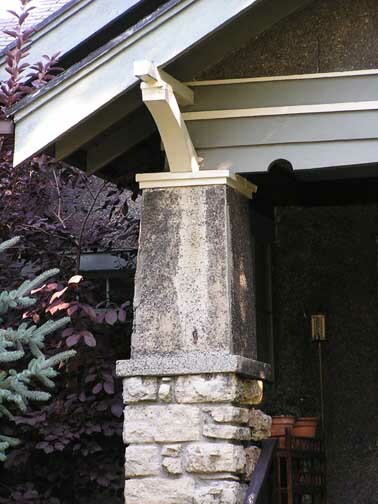 Essential Bungalow feature: widely overhanging eaves with unenclosed rafters which usually are painted. Illustration at left: 416 Parkside Ave. Illustration : 416 Parkside Ave. Illustration at right:: 416 Parkside Ave.
Other example: 42 Tillinghast Pl. The Craftsman style was the most popular design for small residential buildings built throughout the country in the first three decades of the twentieth century. The bungalow was a new form of dwelling that was first used in the 1890s for rustic vacation or resort cottages; it was initially adapted for suburban residential purposes in California. Influenced by the English Arts and Crafts Movement and Oriental and Indian architecture, the style was popularized by the work of two brothers, Charles S. and Henry M. Greene. The Greene's began practicing architecture in Pasadena, California in 1893, and in the ensuing two decades designed a number of large, elaborate prototypes of the style. Their innovative designs received a significant amount of publicity in national magazines such as Western Architect, The Architect, House Beautiful, Good Housekeeping, and Ladies' Home Journal. By the turn of the twentieth century, the design had been adapted to smaller houses, commonly referred to as bungalows. It was this scaled down version of the Craftsman style that became a ubiquitous has in residential neighborhoods during the early twentieth century. The Craftsman bungalow is typically a one- or one-and-one-half-story building with a low- pitched gable (or hipped-roof) set end to the street. The eaves are wide and open, exhibiting structural components such as rafter ends, beams, and brackets. The porch is often the most dominant architectural feature of the Bungalow. They are generally either full or partial width, with the roof supported by tapered square columns that either extend to ground level or sit on brick piers. Shingle, stone, and stucco, sometimes used in combination, were the most common materials. Windows are usually double-hung sash with vertical lights in the upper sash. Another stylistic variation for the bungalow is the use of stock colonial elements. As a modest, convenient, and economical building type, the bungalow became popular with housing contractors and house buyers of limited means. 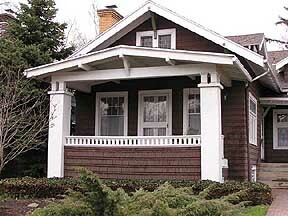 Bungalows may be viewed in a larger context as one type of Arts and Crafts ("Craftsman") style architecture. Arts and Crafts architecture would never have succeeded as a design concept if it had not also met the changing needs of society. American families in the twentieth century were different from nineteenth century families and they needed a different kind of home. Daily living had evolved to a routine where men left the home to work each day, and women stayed home to care for the children. Servants, once plentiful and cheap, became too expensive for the middle class and women assumed the role of sole homemaker..
Housing design had to adapt to this simplified lifestyle. There was no longer any requirement for large houses with formal entertaining areas, family areas, and servant areas. Music rooms, reception rooms, conservatories, parlors, and butler pantries were dropped in favor of "living rooms" and smaller kitchens. Because of increased street noise, Victorian front porches were no longer desirable and they were replaced with sun rooms, sleeping porches, and back screened porches. At the time the lifestyles of Americans were changing, magazines like House Beautiful and Ladies' Home JournalArts and Crafts home architectural styles to their female readers. The Prairie style and the bungalow not only appealed aesthetically to these women as the latest trend in home design, but they fit the requirement for simpler, smaller homes that could easily maintained without servants. The bungalow became the most popular Arts and Crafts home design. Modeled after traditional homes in India and popularized in California, the bungalow was a low, functional, spreading house. It emphasized horizontal lines, overhanging roofs, simple porches, and bands of windows that brought the outside in. The bungalow was usually one or one and one-half stories tall, and was often marketed to beginning homeowners. Particularly small versions of the bungalow were called "bachelor's bungalows" or "workman's bungalows," and were only 600-800 square feet in size. Nearly everyone could afford such a simple house, and the style fit with America's democratic ideals. What these smaller versions lacked in space, they made up for in charm. Gustav Stickley promoted a version of the bungalow in his magazine The Craftsman. The Craftsman bungalow tended to be larger, often two stories tall. Stickley retained the sloping roof line, oversized eaves, and window bands of the traditional bungalow, but relied more heavily on natural building materials like cedar shingles, stone fireplaces, and slate or tile roofs for a rustic look. He often incorporated a pergola on the side as a way to unite the outside and the inside. His interior designs were functional, without ornamentation, and often included built-ins like inglenooks around the fireplace. Stickley published many designs for such homes in his magazine, and in 1909 and 1912 published whole catalogs of Craftsman houses. In 1916 alone, he claimed that over $20 million in Craftsman-inspired homes were built. The expanding prewar economy led to an expanding middle class in the period between 1900 and 1917. Many persons who lived in apartments were able to buy homes for the first time. They selected sites in new housing plats in cities and suburbs (which were now accessible, thanks to interurban transit). To meet the market demand of this new population of homeowners, companies began to advertise in home decorator magazines to sell house blueprints or even "redi-cut" home kits. Kits were popular because they allowed new homeowners to buy their home in stages, a necessity since long-term mortgages were not available at this time. Catalogs of blueprints and kits could be mailed cheaply to potential buyers and kits could be shipped easily via railroad cars. Homes sold as kits represented the highest-priced single item ever sold by catalog retailers. Most catalog home companies were headquartered in the Midwest because of the plentiful supply of lumber. "Common Houses in America's Small towns," by John A. Jakle, et al. Athens, GA: U. of Georgia Press, 1989.